Mark’s telling of the mustard seed parable includes a detail not in the other versions. In Mark’s version, the seed becomes a bush, and birds come and nest in the shade of the branches. Imagine the blessed shade. The story of the mustard seed is found in Matthew, Mark, and Luke. The way Jesus tells it in Matthew and Luke, the tiny seed grows into a mighty tree. Some birds do like to nest high in a tall tree. But other birds—especially many small ones—prefer the shelter of something smaller and more humble. They like shrubs and thickets where they might nest in the branches, and often underneath them in the shade. This is the scene Jesus is imagining when he tells the mustard seed story in Mark. 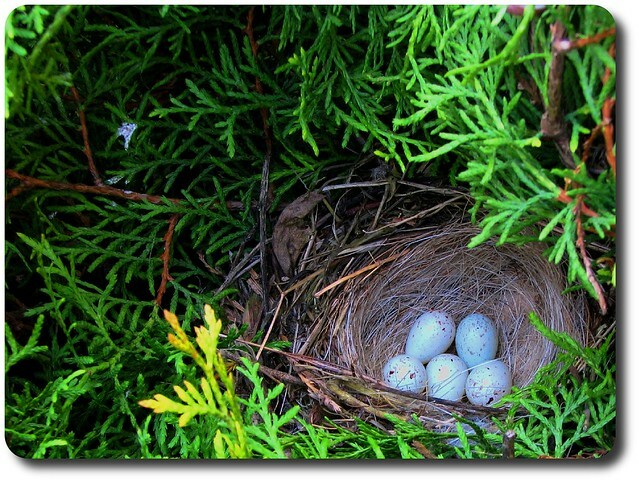 The seed germinates, a shrub grows from it, puts forth branches, and birds come make nests in the shade underneath. Wonderful, blessed, sheltering shade. Imagining the mustard bush sheltering many birds prompted me to read up on what birds find welcoming, things we can do to make our yard a more welcoming habitat. Certainly assisting with food sources and placing houses for birds that like them are helpful. We can provide sheltered spots in the landscaping itself and supply nesting materials. Birds like natural materials like pine straw, but I realized that I can also give them those little ends of yarn left from my needlework projects. I won’t throw those in the trash any more. You can even put yarn scraps and small strips of fabric inside a wire mesh bird feeder, and the birds will come and pull them out with their beaks. The Sylvan Heights bird sanctuary in Scotland Neck has created a village of different kinds of bird habitats on a large scale. Two years ago when the Morton Salt Shakers (our daytime fellowship group) visited, we were able to go into a special area where we could feed the birds, and they would literally hop on our feet and land on our arms and hands. It was a place where the birds felt perfectly safe around us humans. Mighty trees make good and beautiful bird habitats, but so do humble shrubs. To create a welcoming habitat, all it takes is one seed that falls on or into the ground, breaks open and dies to its old form, so new life can come out. That one seed can bless many birds. This is what the kingdom of God is like, Jesus said. It is like a tiny mustard seed sown on the soil. It germinates and grows up into a great shrub, and puts forth its branches. The birds of the air come and nest in the shade. Welcome, welcome shade.